i had never met the doctor who was on call that day – and the first thing he suggested when we got into the room was that he break my water. we declined. the dr. and nurse read my birth plan – and both of them seemed somewhat understanding of our preferences. Classes starting Thursday Evening October 9th and Saturday Morning October 11th. Class size is limited to only 5 couples per session. A great time to start class is in your 4-6 month. $399 per couple, includes all materials, CDs, etc. Complete Childbirth Education Course, which teaches nutrition, exercise in pregnancy, how to stay low-risk, the process of birth and valuable self-hypnosis techniques that allow Mom to automatically produce a natural anesthesia throughout her body and remain completely relaxed during labor. Relaxed and Confident Mom and Dad throughout pregnancy, labor and birth. Fewer complications and interventions, as the body and mind stay completely relaxed during labor. Our students are taught how to stay low-risk and healthy during their pregnancy. Elmination of the Fear/Tension/Pain Syndrome. Easier Recovery, with less pain, bleeding and “baby blues”. Some Wonderful Statistics about Hypnobabies! The following are statistics for the “Hypnobabies” method only (a 6 week course, 18 hours of instruction). Other hypnosis for birthing methods do not offer such in depth instruction, and many do not track results. Pain-free, entire birthings…70-75%. Women who report that they felt nothing but pressure. Pain-free until transition…10-15%. Pressure only, until the 10-60 minute transitional period, with mild to intense degrees of sensation or discomfort thereafter. Pain-free until “active” labor…10%, with mild to intense degrees of sensation thereafter. A new blog about eating well during pregnancy. In Hypnobabies we teach the importance of nutrition in helping moms stay low risk and healthy. The goal of Beyond Prenatals is to encourage and empower women to learn more about nutrition during the preconception period, pregnancy, and early childhood. Visit River Healing for class location and more information. 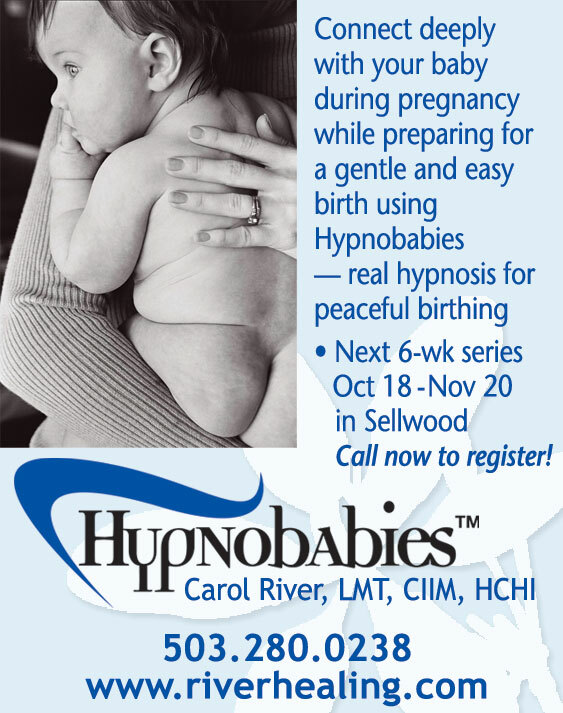 Hypnobabies 6-week complete childbirth education. Classes starting Tuesday (10/21) evenings or Thursday (10/23) evenings. Class size is limited to only 5 couples per session. A great time to start class is in your 4-6 month. $399 per couple, includes all materials, CDs, etc. Choose your evening quickly — these classes fill up since they are the only ones in a 50-mile radius. Whether you are planning to have your precious baby at home, in the birth center or in the hospital, this course will WORK FOR YOU! Hypnobabies is a complete childbirth education course that also teaches Gerald Kein’s famous Painless Childbirth techniques to Hypnobabies mothers so that they can enter hypnosis, deepen it themselves and remain mobile during labor, completely comfortable at all times. Most of our Hypno-babies have no drugs in their systems when they are born, and are able to nurse, breathe well and interact with their happy parents immediately. Relaxed Mom and Dad throughout pregnancy, labor and birth. Both parents participate in the Hypnosis and Fear Release sessions, providing them with a sense of calm and confidence. SAFE BIRTHING INFORMATION NETWORK, Inc.